Aya Matsuura (松浦 亜弥, Matsuura Aya, born June 25, 1986) also known to her fans as Ayaya, is a Japanese pop singer and actress from Himeji, Hyogo, Japan. Aya auditioned in 2000 for the fourth Morning Musume & Heike Michiyo Protegee Audition and was selected along with Sheki-Dol to become a part of what was later known as Hello! Project. It is a common misconception that Aya originally auditioned to be a part of Morning Musume, which she did not. After being chosen from that audition, Matsuura began her solo career. In time, she would become one of Hello! Project's biggest acts. Aside from a successful solo career, Matsuura (nicknamed Ayaya), also did numerous collaborations with other members of Hello! Project, including special, usually short lived groups Gomattou with Maki Goto and Miki Fujimoto; Nochiura Natsumi with Maki Goto and Natsumi Abe; and DEF.DIVA with Maki Goto, Natsumi Abe, and Rika Ishikawa. She also did the "Folk Song" series which feature Yuko Nakazawa and other Hello! Project artists, as well as Hello! Project's shuffle groups (3nin Matsuri in 2001, Odoru 11 in 2002, Salt5 in 2003, and the larger H.P. All Stars in 2004). She also formed the duo GAM with Miki Fujimoto in debuted September 2006. Their first single, "Thanks!" reached the #2 position on the Oricon. Matsuura starred in the Japanese film Sukeban Deka: Codename = Asamiya Saki (known internationally as Yo-Yo Girl Cop) opposite Rika Ishikawa, released on September 30, 2006. On October 9, 2006 both concerts she was supposed to hold that day were cancelled, as she was not feeling well. Soon several unsourced rumours emerged considering the possibility she might be suffering from Temporomandibular joint disorder. Following the cancellation of the two concerts, Matsuura's management confirmed the rumours, reported the young idol had been taking painkillers to continue working and scheduled a press conference to discuss her condition. On the following day Matsuura made a public statement on PBS apologizing to her fans and expressing her desire to get back to her singing career as soon as possible. Since her press conference, Matsuura returned to her normal hosting duties on her weekly radio show, "Matsuura Aya no All Night Nippon" and returned to singing in a limited capacity, as demonstrated on her appearance on Hey! Hey! Hey! Music Champ on October 23, 2006. 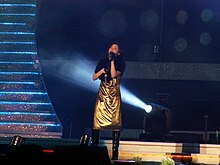 On March 8, 2008, Matsuura—as a secret guest—performed at the opening ceremony of the Fourth Special Olympics Japan Winter National Games, a national event in preparation of the 2009 Special Olympics World Winter Games held in Boise, Idaho. She performed the song "Kizuna", which was released on May 21, 2008 as her 20th single. It was officially announced on October 19, 2008 that Matsuura would be graduating from Hello! Project along with the rest of Elder Club. Before her graduation, Matsuura released her fifth studio album, Omoi Afurete, on January 21, 2009, and her 21st single, "Chocolate Damashii", was released on February 11 for Valentine's Day. Matsuura graduated from Hello! Project on March 31, 2009, but months later, on August 26, 2009, Matsuura launched her own blog called Ayablog and announced that her Omoi Afurete tour will be her last for two or three years. However, she has since released a Cover Album (Click You, Link Me, 2010). In late August 2011, it was revealed that she is diagnosed with endometriosis, which has been and will continue to limit her concert activities in the future. However, from 2009 to 2013, She has consistently released Acoustic Concerts, known as "Aya Matsuura's Maniac Series". She was signed to UpFront Create, along with some of the members of the Hello Project! Elder Club. Matsuura has appeared in many commercials for various companies; notably Pretz snack foods, Epson color printers, and Kirin beverages. She has also taken part and co-hosts the television show Utawara with other names in Japanese entertainment such as Johnny Jimusho's Jun Matsumoto. Matsuura and Keita Tachibana registered their marriage on August 4, 2013, after almost 12 years of dating. They held their wedding ceremony in Hawaii on October 7. On December 21, 2014, the couple announced the birth of their first child, a baby girl. 6 Click you, Link Me November 24, 2010 #72 3,007 ? 7 10th Anniversary Best December 21, 2011 #? ? ? † A cover of Chisato Moritaka's 1993 original. The bridge in the title is one of twelve bridges that cross the Watarase River in the city of Ashikaga. †† Last release within Hello! Project, as she graduated soon after its release. Hello! Morning (ハロー!モーニング。) April 2000 April 1, 2007 TV Tokyo, etc. Fried Chicken (2008, FamilyMart) -- also the song "Kichin to Chicken" lyrics and music by Fujioka Fujimaki, a folk song duo. Roots Aroma Impact (since 2010, JT Foods), etc. ^ The only Hello! Project members to date that have done so, and been placed elsewhere are Mai Satoda, Miuna Saito and Miki Fujimoto; Fujimoto would be later inserted into Morning Musume anyway. ^ "Ayaya to promote Special Olympics" (in Japanese). Nikkan Sports News. March 8, 2008. Archived from the original on 14 May 2008. Retrieved April 30, 2008. ^ あやや応援歌「きずな」心こめて歌う (in Japanese). sponichi.co.jp. March 8, 2008. Archived from the original on March 18, 2008. Retrieved April 30, 2008. ^ "Aya Matsuura will sing the Special Olympics Official Support Song" (in Japanese). Hello! Project. Archived from the original on 10 May 2008. Retrieved April 30, 2008. ^ "Elder Club members to graduate from Hello! Project". Hello!Online. 2008-10-19. Archived from the original on 24 January 2009. Retrieved 2008-12-23. ^ a b "Omoi Afurete" (in Japanese). Up-Front Works. Archived from the original on July 7, 2009. Retrieved January 21, 2009. ^ a b c d "Chocolate Damashii" (in Japanese). Up-Front Works. Archived from the original on 19 January 2009. Retrieved 21 January 2009. Wikimedia Commons has media related to Aya Matsuura. This page was last edited on 17 April 2019, at 05:47 (UTC).